Born in Hazelhurst, Mississippi in 1911, Johnson came to prominence in the `30s, recording his 26-song catalog during two recording sessions in 1936 and 1937. Considered by some to be the "Grandfather of Rock 'n' Roll", his vocal phrasing, original songs, and guitar style have influenced a broad range of musicians, including Muddy Waters, Bob Dylan, Jimi Hendrix, Led Zeppelin, The Rolling Stones, Johnny Winter, Jeff Beck, Jack White and Eric Clapton, who called Johnson "the most important blues singer that ever lived". He was also ranked fifth in Rolling Stone's list of 100 Greatest Guitarists of All Time. Johnson's shadowy, poorly documented life and death at age 27 have given rise to much legend. 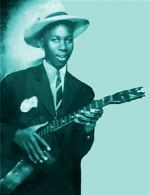 The acclaim for Robert Johnson's work is based on the 29 songs that he wrote and recorded in Dallas and San Antonio from 1936 to 1937. These include "I Believe I'll Dust My Broom" and "Sweet Home Chicago," which has become a blues standard. Robert Johnson came to the attention of many musicians and won over new fans with a reissue of his work in the 1960s. Another retrospective collection of his recordings released in the 1990s sold millions of copies.